Northern Ireland's Daryl Gurney set up a second round meeting with defending champion Gary Anderson by winning his first round match at the PDC World Championship at Alexandra Palace. The Londonderry man beat Jamie Lewis 3-1 in his first round match on Thursday. Gurney, 29, defeated Anderson 10-4 the last time the players met at last month's Players Championship Finals. Brendan Dolan from Belcoo, ranked 18 in the world, will face Australian Kyle Anderson in the first round on Friday. 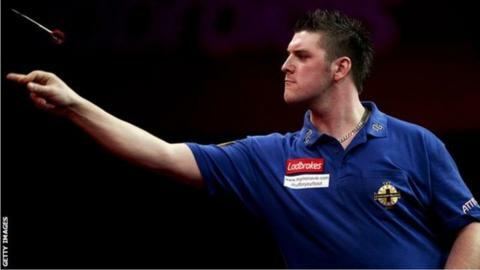 Gurney hit five 180s in an impressive triumph over Lewis on the opening day of the tournament. The world number 36 won three straight legs in a dominant first set, before Lewis took the second 3-1. "I played well in the first set but then I went off my game a little bit," said Gurney, who reached his first-ever televised PDC major semi-final in the Players Championship at Minehead last month. "I could've easily lost that game and been out so I was pleased to get over the line. Gurney will meet Anderson in the second round on Boxing Day.